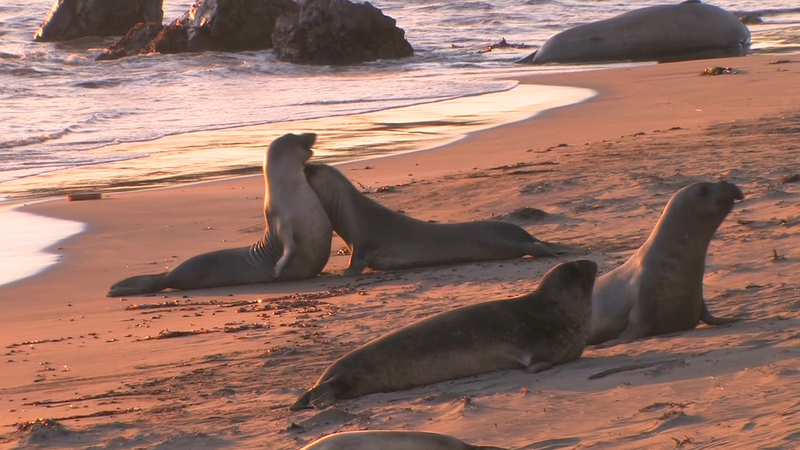 Humans aren't the only ones that are attracted to the California coastline, Northern Elephant Seals migrate thousands of miles to these beaches twice a year to breed, give birth, molt and rest. Their bodies seem to be designed more for spending 8-10 months a year in the open ocean than on land. On land, front flippers take on an almost human quality as they're used for scratching and scooping sand. While in the ocean, hind flippers may be the basis of some powerful swimming, on land they work even harder helping to support the weight of this lumbering giant. Still, it is on land where pups learn to spar in preparation for becoming mature males who will one day challenge one another for their place in the rookery. Large adult males come in from the ocean to challenge all others for top breeding positions. Weighing up to 5,000 lbs., bulls like this one will easily dwarf any of the small pups battling on the beach. The oversized nose, which is where elephant seals get their name, and the scarred chest plate, show the mark of an adult warrior prepared for battle. The combination of his size, huge nose and deep guttural calls will hopefully serve to intimidate challengers. But, if this doesn't work, he's ready to fight. Once thought extinct, this marine mammal has made an extraordinary comeback. From the behavior of their younger generation, their future seems bright and secure. The hind flippers of elephant seals and sea lions have the appearance of feathers. So, it should come as no surprise that scientists have classified them as Pinnipeds, which is Latin for "feathered feet".